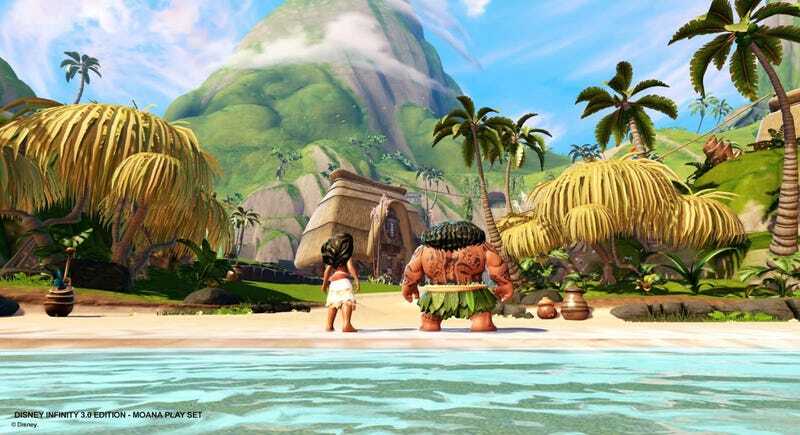 When Disney Infinity was cancelled, it took a lot of in-development projects with it. Some of those involved Star Wars, others Benedict Cumberbatch, but one we hadn’t seen until now (though we did at least know of its existence) is a whole playset devoted to Moana, Disney’s next animated feature film. Unlike individual figures, which are simply dropped in to allow the use of their character, playsets are basically Disney Infinity’s “games”, complete with stories, cutscenes, etc. We don’t have footage of the game—which we’ll now never get to play—but a source close to the project could at least share some screenshots, along with a pic of what the figures would have looked like. A Disney Wind Waker? Could have been fun!